If Walter hadn’t been so sleepy and had paid more attention to Stanley’s projects, the Wimbledons might have been prepared for the very surprising and very funny outcome. 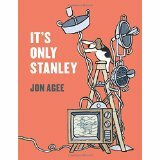 It’s Only Stanley is written and illustrated by Jon Agee and is perfect for kids ages 3 to 8. The story is told in clever rhyme right down to the big kapow! at the end. Full of silliness and fun.